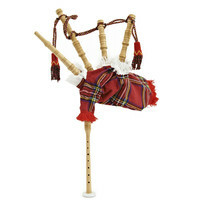 These Chanter Junior Bagpipes are specifically designed for anyone wishing to learn how to play the bagpipes. The set includes full working chanter with imitation drones and ivory mounts. This entry was posted in Gear4Music and tagged Woodwind-Brass-Strings. Bookmark the permalink.